Be inspired by local heroes. Support sustainability in Philly. Attend the SustaInPHL Awards, an annual celebration for sustainability visionaries to unsung heroes making a difference in Philadelphia. Nominees are listed here. Please note this event is Cocktail Attire. Sample local fare and drinks. 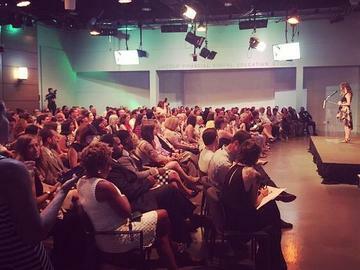 Hear inspirational stories from Philly changemakers. See the winners announced live on stage and receive reclaimed wooden awards created by RAIR. Presenters for the event are Bill Golderer, Founder of Broad Street Ministry and Co-Founder of the Rooster Soup Company, the nation’s first for-profit, crowd-funded social impact restaurant. Judy Wicks is an author, activist and entrepreneur and founder of Philadelphia’s iconic White Dog SustainPHL 2016 Sustainable Pioneer award recipient. Cafe. Nic Esposito is the Zero Waste and Litter Director for the City of Philadelphia and SustainPHL 2016 Unsung Hero award recipient. Saleem Chapman is the Policy and Advocacy Manager at the Sustainable Business Network (SBN) and SustainPHL 2016 Local Advocate award recipient. Heavy hors d’oeuvres and small plates by 12th St Catering. Sample fare from Hungry Pigeon, Hungry Harvest, Sweetgreen, Crust Vegan Bakery, Collective Creamery, Pennsylvania Cheese Guild, Birchrun Cheese, Valley Milkhouse, Hidden Hills Dairy and Starr Catering. Open bar including drinks from Stateside Vodka, Dad's Hat Rye, Manatawny Still Works, Reanimator Coffee, Allagash, Saint Benjamin's Brewing, Flying Fish, Eight Oaks Craft Distillery, Philadelphia Distilling and more. Munch & Learn: Learn something new in these sustainable exhibits. Exhibitors include will include Clean Air Council, Green Philly, CUSP Climate City, Pennsylvania Horticultural Society, Franklin Institute, Philadelphia Water Department, Indego Bike Share and Philadelphia Beekeepers Guild. Awards reception: See the winners announced live! Early access – enter at 6 PM! Mingle with the nominees during the VIP cocktail hour. NEW this year: Create a DIY Terrarium for VIP only! Preview & skip the lines for a bonus hour of our “Munch & Learn”, food & adult beverages. Please note ticket processing fees will go towards SustainPHL's philanthropy, thanks to our partnership with Ticketleap.